A few weeks ago we made quick house hunting trip to Ohio. We had a very limited time there and needed to make the most of every house hunting-school touring minute. I needed someplace to corral the onslaught of paper and keep everything organized. On the left I had all of our travel reservations/tickets for our flight, hotel and rental car. I also had a School Tour Information Sheet that I typed up with a list of questions to ask during the school tour. On the right, I printed off all the houses we hoped to see and clipped them together by neighborhood/area. We also included a Neighborhood Comparison Sheet where we could jot down pros/cons for each area. Our realtor had set up a virtual client portal for us where we could move house listings that met our requirements to a "Save" list or a "Reject" list. Before the trip we took another look at our "Saved" list and picked the top 10 homes we wanted to see. We made sure our realtor knew which were our top 2-3 picks in each neighborhood and we said a prayer that we would be able to schedule showings during our very last minute trip. The great thing about having this folder assembled before we left is that we actually had time to prepare ourselves while traveling. The days leading up to this trip had been insanely busy and waiting in the airport (and during our flights) was the first time we were really able to sit down with all this information without the distractions of trying to sell our house. Although your realtor will likely have copy of the listings printed for you when you arrive at your destination, having the house listings printed ahead of time allowed us to take a closer look at them on the plane and then write down notes for each property right on the form as we toured them. We looked at so many houses and after awhile they all sort of blended together. When we got home we were able to go back and look up the listings online, but now had additional notes to help us narrow down our choices. The School Tour Info Sheet functioned much in the same way. We were able to look over our questions before meeting with the school, and write our answers and notes right onto the form. 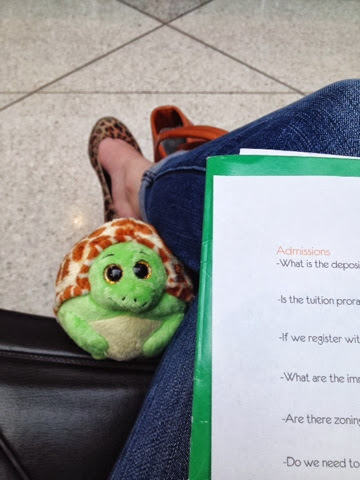 That little turtle helping me prep for the school tour is Zoom. If you missed that post, we picked him up at the airport and took pics of him with us throughout the house hunting trip. We sent the pics back to the kids and it was a fun way to include them on the process since they didn't make the trip with us. It was an all around whirlwind of a trip, but this folder kept us sane. It helped us to prepare on the way, stay organized while we were there, and sort it all out when we got back home. One thing I didn't anticipate was all the paperwork we would be bringing back with us. From listings, to brochures, to application forms...there was not a single place we visited that we did not leave without new papers in hand! They went right into one of the folder pockets and we were able to sort through it all once we landed back in ABQ. Our Printable Contact List was also a great place to jot down all those new contacts. I would love to hear your survival tips for house hunting! Any things that helped keep you sane and keep it all organized? How did you narrow down your search for schools, homes, etc?